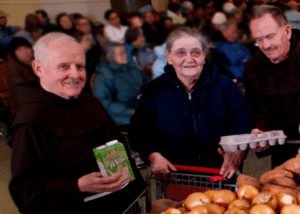 St. Anthony Shrine depends on dedicated volunteers to help carry out the mission of the Shrine to provide a welcoming place of love for all God’s people. There are 20+ programs and ministries at the Shrine that serve the needs of our worshippers and surrounding communities. Our volunteers are a crucial part of the Shrine and contribute throughout our ministries to help us live the mission of the Shrine. We strive to make the volunteer environment and community at St. Anthony’s Shrine a vibrant and fulfilling opportunity for each of our volunteers. Each volunteer candidate completes a volunteer application, including emergency contact information, a signed confidentiality statement, and written consent to complete a CORI check (Criminal Offender Record Information) if necessary. The director of volunteers for St. Anthony’s Shrine interviews all volunteer candidates. Review of the volunteer packet is completed, including the CORI process if necessary. The volunteer is matched to a ministry or ministries. Once all of the paperwork is complete, the director or the volunteer coordinators for the chosen ministry will reach out to the new volunteer to map out a schedule and conduct any training or orientation. This process takes about one month to complete — while the paperwork is being completed, you are welcome to keep in touch with Julie Ogden on any questions. Print out the PDF application form, fill it out and mail it to Julie Ogden, using the address on the form. Julie will contact you after your application has been received to set up a meeting at which you can learn more about the process and opportunities.